In her new book, Seeds of Terror, journalist Gretchen Peters makes the compelling argument that the Taliban and al-Qaeda in Afghanistan have evolved (or devolved) from purely religious terrorist groups into narcoterrorism syndicates with religious overtones. The drug trade nets them $500 million a year in profits, resources the militants use in their fight against Western forces. Until that supply of cash is cut off, Peters argues, Western forces cannot defeat the militants. But this transformation also provides Western military commanders with opportunities they can exploit. Local populations that tolerated or supported the Taliban and al-Qaeda for ideological reasons are less likely to back criminal gangs. If Western commanders and the governments of Afghanistan and Pakistan can help protect and organize local communities, they stand a better chance of winning the war. You report that the Taliban and al-Qaeda are now raising $500 million a year from the opium trade. What does that mean in terms of their capabilities and what they are able to do with that sort of money? It's clear that drug money is paying for the Taliban's operational costs within Afghanistan. That means that every time a U.S. soldier is killed in an IED attack or a shootout with militants, drug money helped pay for that bomb or paid the militants who placed it. 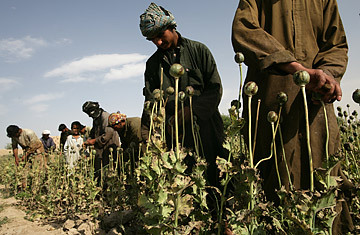 Opium funding helps pay for salaries, weapons, explosives and food. The Taliban is a self-sustaining organization financially. We see an example of this in their recent attacks on the Pakistani government, like the bombing of the Inter-Services Intelligence offices in Lahore recently. The Taliban have now thrown off their old masters and are a full-fledged criminal force on both sides of the border. They are beginning to sound like an organized criminal enterprise that happens to have some echoes of a revolution  like FARC in Colombia or Sri Lanka's Tamil Tigers. Right. We often compare the war in Afghanistan to the war in Iraq, and in my opinion, it much more closely parallels the war in Colombia and the transformation of the FARC from a Maoist group into a criminal smuggling organization that came to control a Switzerland-size chunk of Colombia. [Many] of the Taliban commanders have lost their ideological roots and are really just in it to make a buck. I'm not trying to suggest that they have put aside their intention to drive Western forces out of Afghanistan, and I do not believe that al-Qaeda has put aside its intention to launch further attacks on the West. Far from it. Increasing casualty rates in the region, both among locals and among NATO troops, proves that they are actually more violent and more dangerous. But one opportunity that comes out of this is that they are also far more hated by the local population. If you read the reports coming out of Swat, out of Southern Afghanistan, out of Kandahar, Helmand, the tribal areas in Pakistan, increasingly the people of the border areas refer to them as criminals and gangsters. They really are more similar to Tony Soprano than the Che Guevara image we have. They are hardly behaving like pious Muslims. See pictures of the wars in Iraq and Afghanstan at LIFE.com. Watch a video on the challenge for the U.S. military in Afghanistan.